Taglines: It's excitement all the way as Steven Spielberg and Richard Donner, the makers of 'Indiana Jones', 'Gremlins' and 'Superman', combine forces to create the Family Adventure of the year! When Chunk is hiding from the Fratellis in the refrigerator with the dead body, he sneezes loudly. As Mama Fratelli exits the room she unwittingly says "Gesundheit! ", the German word for "Health" used as a response to a sneeze. Continuity: When Chunk follows Sloth down the hole in the fireplace in the basement of the restaurant, he grabs a lantern. He quickly touches it to turn it on, as if it had a switch. Prison Guard: Lunchtime! The longer you animals bark, the colder your lunch gets. Come on, move it out. You too, down there! Hey, turkey! Just prior to graduating with a degree in Film Studies a lecturer asked us, "So what's your favourite film now?" Whilst my peers spouted out Goddard films and obscure German expressionist shorts I sat quietly thinking; my favourite film has been My Favourite Film since I was seven... So when it came to me and I mumbled "The Goonies", I was expecting scorn, ridicule and possibly minor injury, but instead was met with concurring shouts and whoops and cries of "Hey you gu-uys!" from the rest of the class. 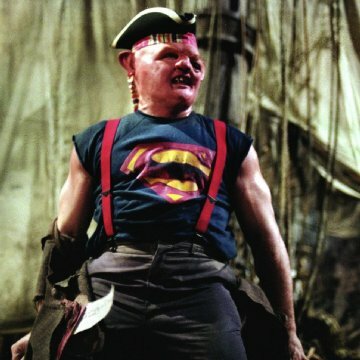 You see this is the unifying thing about The Goonies; mention it in a room full of twenty-somethings and they'll whell up and utter "Sloth loves Chunk" or adopt a harassed Chinese tone "Thats what I said...Booty traps!". And if that room happens to be a pub, several chairs will scrape back and semi-inebriated grown men will lift their shirts, shake their bellies and revel in the truffle shuffle. People may say it's an Indiana Jones wanna-be I think that is the defining beauty of it all. 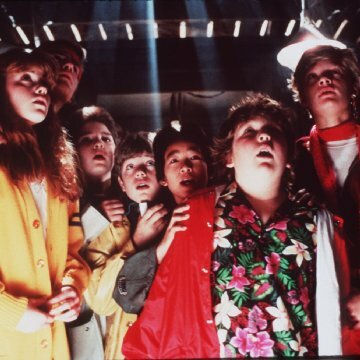 When we first watched The Goonies it was like watching our dreams come true on screen! 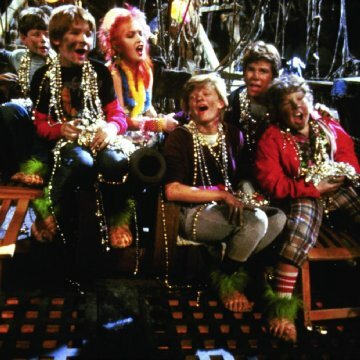 We'd loved seeing Indiana's adventures and escapades and in The Goonies we saw kids like us actually doing it! They got to be just like the mini-Indies we imagined ourselves to be in the playground. 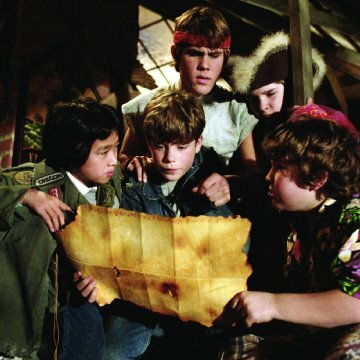 But its not just the adventure that makes us love the film, we love those Goonies themselves. They were like our friends. We got annoyed with them sometimes, and we wanted to protect them, and we laughed at their jokes and cheered when they had a brilliant plan. 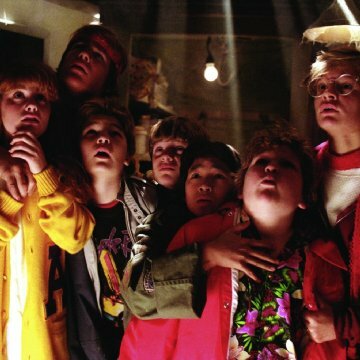 Identifying with those kids was what we loved and why, as adults, we quote them and 'become' them when talking about the film. I still want to be like Andy, having a perilous adventure sliding down tunnels and facing the bad guys on a huge pirate ship... but of course also making time to kiss Brand AND Mikey! 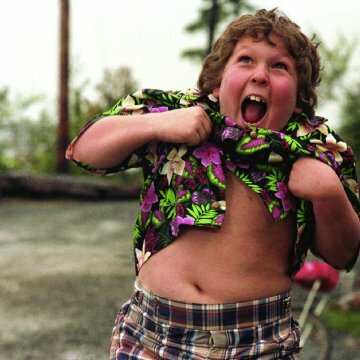 I also think that this is why Goonies 2 is such a relevant and exciting concept. We've all grown up together and I'd love to see how the guys are doing now...I just hope it doesn't disappoint... So if you've not seen it do it right now, and if you have kids sit them down, hold their hand through the scary bits and enjoy! They'll thank you in twenty years time!